The apartment is located within a 1960s housing-block in Madrid's Acacias neighbourhood, which is described by the architects as a modern take on the traditional Spanish corrala – blocks of flats linked by external corridors that look out over a shared interior courtyard. The apartment's owner is a young doctor who works in the local hospital and shares the apartment with his pet bulldog Albóndiga, which means meatball in Spanish. Both the doctor and his dog had a number of requirements that the architects noted after observing their daily activities. Both are very sensitive to the heat, so needed a well-ventilated apartment that could stay cool during Madrid's hot summer months. In addition, the living room needed to be large enough to enable a variety of activities such as stretching out and watching TV, writing up medical reports and entertaining friends. The home also needed to be spacious enough for the doctor to invite friends to stay over without having to open out a sofa bed, which would take up a lot of space in the living room. "The original layout of the apartment had a double east-west orientation, but the excessive compartmentalisation of the spaces obstructed the cross-ventilation in the bedrooms, which meant that the west-facing spaces were excessively hot in summer," explained the Madrid-based architects. To address the issues, the interior space was redistributed to create an ample living area, open on both east and west sides of the building, which allows air to circulate during the hot summer months. 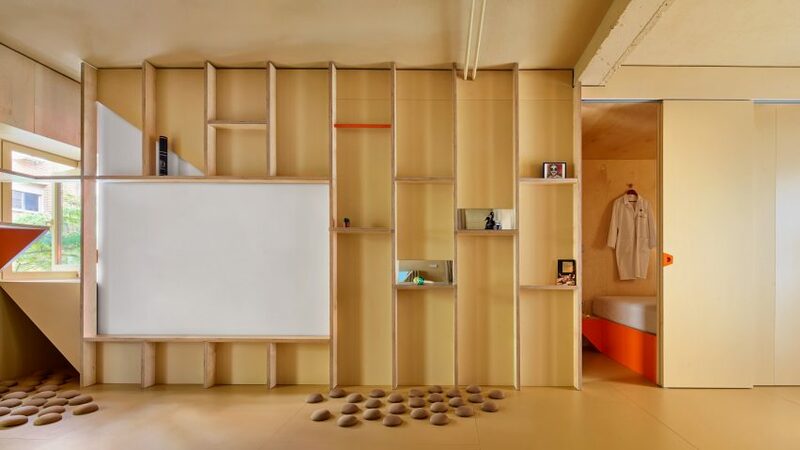 The walls, storage units, and floors are made of a combination of plywood boards and pine wood pieces made in a carpentry workshop and assembled on-site. "We avoided plastering the walls, opting instead for a solution with breathable mortars in the bathroom, walls, and ceilings," said the firm. In addition, the architects considered the doctor's sleep pattern. Working in the hospital emergency room means that he is often required to work night shifts, so it's important to take naps during the day. "We realised that a siesta space should be an important feature of the design," said the firm. "It would preferably be an alternative to his usual bed, which would be reserved as a place to sleep at night." Distributed within a 1.5-metre-wide strip along the south side of the apartment is the bedroom, a dressing room, a storeroom, and a multi-use capsule that works as a space to receive guests who might stay overnight. The capsule also doubles as an alternative place to take naps. "This capsule-periscope is the ideal place to read, since it allows the reader to sit with their back to the window and simultaneously enjoy the view of the acacia trees on the street, as well as the sky, via an interplay of mirrors," said the architects. "By closing the sliding door, the space inside becomes private, and from the outside the door works as a great video projection screen." On the floor, a series of cotton hemispheres serve as islands for the bulldog to rest on. They are fixed to the floor with suction cups, which enables the owner to choose and change their placement. The architects were keen for the apartment to contrast with the "antiseptic, supposedly neutral and white ambience" of the hospital ward where the doctor works, and so used warm colours and natural materials such as pine and birch plywood to create a cosy atmosphere. Husos Arquitectos installed a vertical vegetable garden on the balcony that overlooks the apartment block's central courtyard. Visible from the corrala, the garden is protected on the inside by a set of two curtains, one made of transparent plastic that creates a greenhouse effect in winter, and another made of a porous textile that provides shade in summer. "The tomatoes, herbs, and other species planted in the new domestic vegetable garden will provide an excess of produce that he will be unable to eat on his own, giving him the option of sharing it with others," said Husos Arquitectos. "In this way, the vegetable garden supplies not only food, but also the potential for extending the relational capacities of the dwelling." The design also includes a watering system that makes use of the grey water from the shower. Water is temporarily stored and then filtered to irrigate and maintain the plants which, as well as providing food, work as part of the thermal control solution to keep the interior cool. The architects said that this method is so successful that it was not necessary to install any mechanical cooling system such as air conditioning, even for the hottest months of the year. 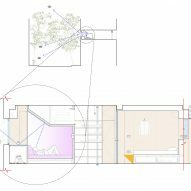 "This home is the spatial translation of this pair of flatmates' different needs and specific wishes, but we believe that it also opens up the possibility of a new typological configuration and of the implementation of multiple strategies for many other, very different social micro-realities and forms of home in a small living space," concluded the studio. 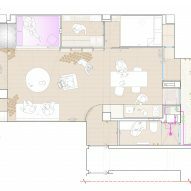 This apartment in Madrid by Lucas y Hernández Gil uses sliding partitions to divide up a space that had also been badly compartmentalised, with the same ambition of creating both a private space and one suitable for entertaining.